SharpFutures is a social enterprise that supports young people into employment in the creative digital sector. SharpFutures’ apprentices staff the front of house / reception at Space Studios Manchester as well as providing running services for onsite productions. By offering a range of interventions including Apprenticeships, Work Experience and Volunteering, SharpFutures nurture the transition into work, whilst responding to the fluctuating needs of creative digital businesses. We SEED ideas through services for education, we NURTURE the best talent we find through employment opportunities and real work experience, and we GROW through the sale of our business products and services. SharpFutures SEED ideas through services for education, we NURTURE the best talent we find through employment opportunities and real work experience, and we GROW through the sale of our business products and services. 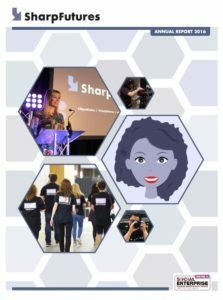 SharpFutures POD is a pool of entry level, eager to gain experience, new entrants with the ability to provide important, flexible support to fledgling and fast-growing businesses in the creative digital sector. With members recruited and retained based on a desire to develop sector-relevant skills, SharpFutures POD offer clients the opportunity to bring on board temporary, support staff while also playing a valuable part in young people’s career development. Committing to a new full-time team member may be a stretch for small businesses, whereas having had the opportunity to ‘try before you buy’ can give employers confidence to commit. Flexible, adaptive, enthusiastic and on-call to meet your business needs, SharpFutures POD provides a unique support service for creative digital businesses, while helping to identify and bring through, new talent in the creative digital sector. Nurturing and supporting the organic development of individuals and businesses on both sides of the employer / employee divide, SharpFutures POD provides much needed support when and where it really makes a difference. SharpFutures [FRAMED] is the latest project from SharpFutures, a culmination of the final projects from our placement scheme; who produced a few films between them. To keep up-to-date with SharpFutures [FRAMED] check-out the dedicated website and follow the youtube channel. SharpFutures Discover offers a variety of packages from school experience days to large-scale events. With access to a range of pioneering creative digital businesses based at The Sharp Project and Space Studios Manchester, along with a first class network of industry experts across the UK, SharpFutures Discover offers tasters and career insights into this growth sector. The aim of SharpFutures Discover is to broaden horizons and unlock potential for the creative digital workforce of tomorrow. The advancement of education in Creative and Digital Sectors. To build capacity and opportunities in the creative digital sector in deprived communities. To create and sustain careers. Creative Digital is one of the fastest growing sectors in the North West region and Manchester is the largest creative digital hub outside of London; there are currently 3,000 businesses in Manchester alone creating 25,000 employment opportunities in this sector. For further details please visit the SharpFutures website. SharpFutures is based at The Sharp Project in Blue 056.